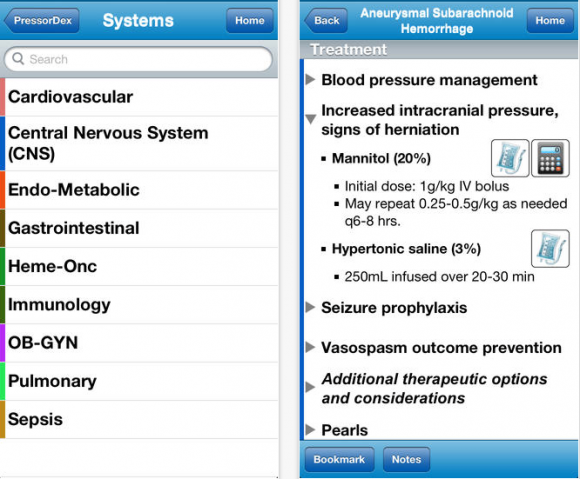 The following is a list of 10 essential medical apps Emergency Medicine providers should have on their smartphones. Links to iPhone and Android platforms are provided for each app. The apps are listed based on my experiences working in the Emergency Room and the app reviews that have been done prior at iMedicalApps. An essential tool for Emergency Medicine physicians. This app not only includes information about vasoactive agents, but gives dosing and treatment information for almost every single type of critical care situation that arises. Android Link: Currently not available — it’s unfortunate EMRA has not created an Android version of their popular critical care handbook.